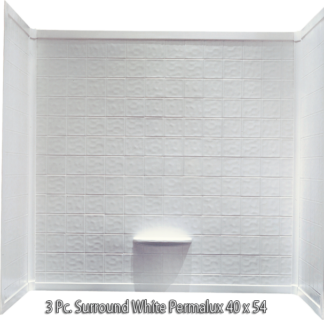 View cart “3 Piece Surround White Permalux Tile Finish for 40×54 Garden Tub” has been added to your cart. 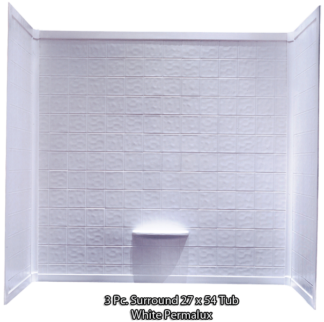 3 Piece ABS surrounds for 28″ x 5″4, 36″ x 36″, and 32″ x 32″ shower pans. These shower pans have a tile finish and are available in white or almond. No corner caddies are required as these panels are designed to interlock with each other for an attractive finish. 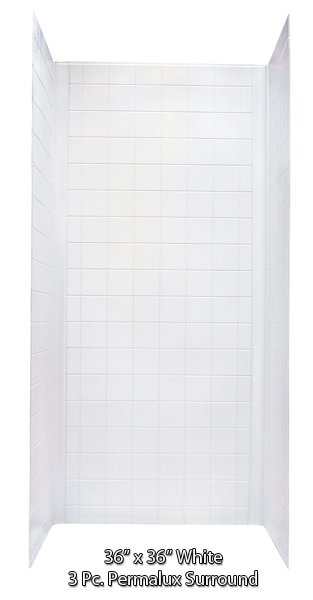 All shower surrounds come standard at 68″ high. 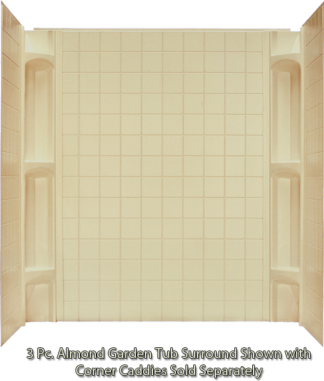 Two- piece surround in picture frame design manufactured specifically for 54″ x 54″ garden tubs. Available in white only. 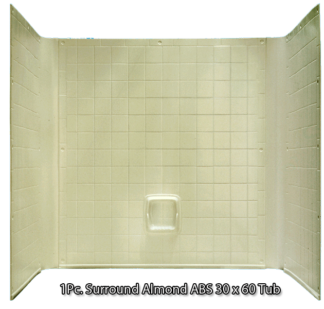 One piece ABS tub surrounds are available in white or almond. With a straight wall tile finish and flanged lip at bottom these surrounds make for an easy installation. 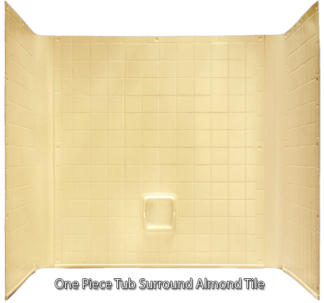 All one piece surround for tubs and garden tubs are 57-3/4″ tall. 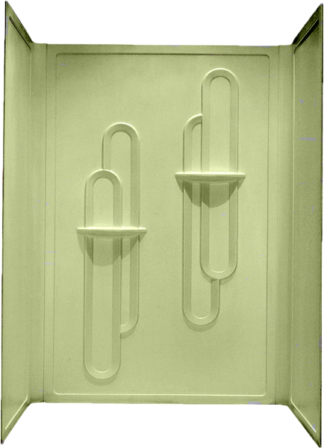 They can be installed with spray adhesive, tub rivets, or both. 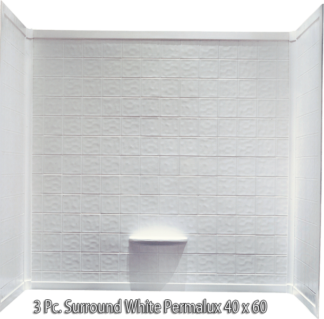 3 piece Permaulux® surrounds are manufactured of a durable abs material with an acrylic coating adding strength and shine to your tub or garden tub. These surrounds do not require the use of corner caddies as the side walls and back walls snap into place. They will match beautifully with your Permalux® tub. These surrounds are easy to maintain and with their smooth texture, they are easier to clean than standard abs surrounds. For information on how to install these surrounds, please be sure to visit the installation instructions in the tub section of our web site. 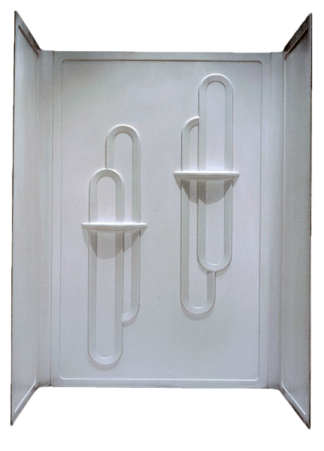 3 piece surrounds for the garden tubs are manufactured of durable abs materials and are available in white or almond. They attach easily to your existing wall with tub rivets, adhesives or both. Installation of the 3 piece sshower insert requires the addition of corner caddies which are sold separately. The corner caddies add function as well as look to your new garden tub and surround. 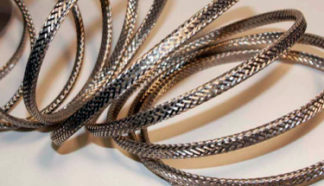 For more information on the installation of 3 pc garden tub surrounds, please be sure to visit our installation instructions in the tub section of our web site. ABS Corner caddies come two per carton. These caddies are available in white or almond and match perfectly to the garden tub and abs surround. Corner caddies add both function and good looks to any garden tub surround. 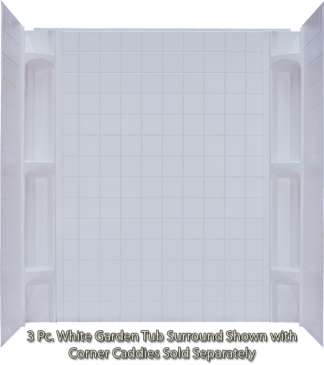 Be sure to add corner caddies when purchasing a 3 piece ABS garden tub surround. 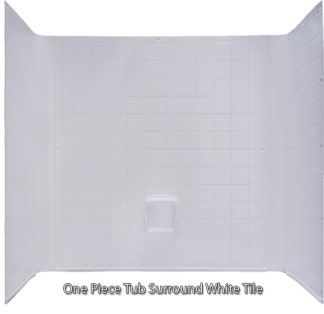 Better Bath White ABS Surround for 36″x36″ Shower Pans Tile Fin.